If GUI and the command-line interface (CLI) were professional wrestlers, GUI would be a hugely muscled, masked warrior who enters the ring accompanied by "GUI the Hero" theme music. CLI stands in the opposite corner, looking grim and puny. GUI is the obvious crowd favorite, but when the bell rings, there's little doubt about who will prevail. CLI is clever, nimble and knows how to break all the holds GUI brings to bear. Two minutes into the first round, GUI is pinned for the count. 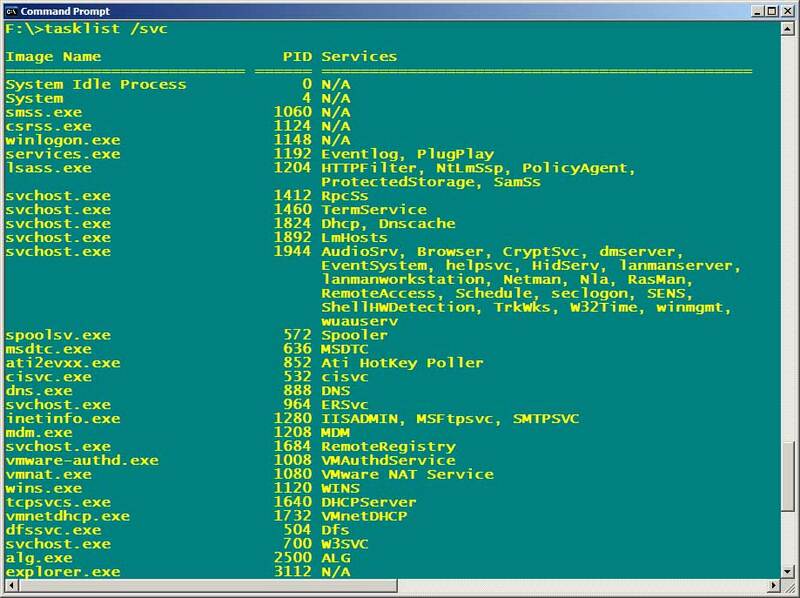 As it turns out, a Windows server running Windows Server 2003 has nearly all the CLI utilities needed to do everyday administrative chores. You rarely need to use a terminal server client or one of those fancy-schmantzy Adminpak workstation tools. Just keep an open console prompt on your desktop and follow along as I show you some of my favorite administrative utilities. If you spend lots of time at the console window, you might as well make things comfortable for yourself. Open a console window, then right-click the upper left corner (or the title bar) and select Defaults from the flyout menu. Don't select the Properties option. Any changes you make using this option are only applied to console windows with the same name in the title bar. Figure 1. Enabling QuickEdit mode facilitates cut-and-paste operations between the command line and graphical utilities. 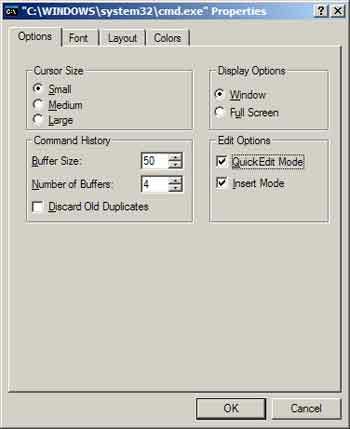 In the same window, select the Fonts tab and shift from raster fonts to Lucida Console fonts and choose a size that's comfortable to read but puts as many characters as possible on a single line. Select the Layout tab and set the Window Size to a width and height that makes maximum use of your screen. For example, on my 1400x1050 laptop display, I use a 12 point font with a 170x70 setting for the console window so it covers the display completely. Click "OK" in the console Properties window to save your changes. Close the console window and open a new one to see the new default settings. Enter a command or two, then press F7. This lists the last 100 commands you've issued in that console session. Select an item from the list to perform the command again. Pressing F3 displays the last command you entered. The focus of the window is set to the current folder. Similarly, if you find an executable in Explorer you want to run from a command prompt, just drag the icon to a console window. The command line populates with the full path to the executable. Just press Enter and you're off to the races. A faster alternative to this drag-and-drop trick is to install the CMDHere.inf utility from the Resource Kit. This places a CMD Prompt Here item in the property menu for a folder. To install the utility, simply right-click the icon and select Install from the flyout menu. You could also follow the instructions in Knowledge Base 320148, "Start a Command Prompt in a Folder in Windows 2000." This creates the account, enables it and prompts you to enter and confirm the user's password. 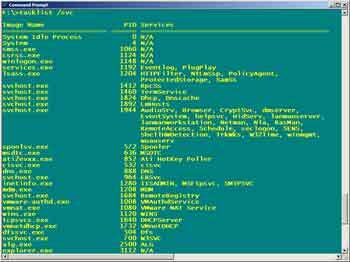 The DSADD command is also useful for creating OUs, groups, contacts and other objects. You can change object settings with DSMOD, move the object to a new OU with DSMOVE and delete the object with DSRM. To see the running processes on a local machine, don't open Task Manager. Use TASKLIST. (In Windows 2000, use TLIST). To include the process owner and CPU utilization in the listing, use TASKLIST /v. I also like TASKLIST /svc because it shows top-level executables and the services running under them. Figure 2 shows an example. The "/fo csv" switch tells Systeminfo to format the output in a single, comma-delimited line item. This may seem simplistic, but here's where your command-line knowledge pays off. The extended batch language in Windows has a command called FOR that lets you quickly create looped commands. For example, the following statement loops through each line in a text file called Serverlist.txt, runs Systeminfo to get the statistics for the designated server, and stores the result as individual lines in a comma-delimited file. The resulting spreadsheet has two columns, one with the full Distinguished Name (which you can delete) and one with the bare flat name of the servers, which you can then use as an input to the FOR command. You can use Netsh to quickly and easily change the settings for Windows 2003 and XP network bridges, the Windows Firewall, Remote Access Services (RAS) and LAN routing. You can also dump the entire set of network settings for all interfaces to a flat file to import to another server or back to the same server after it has been rebuilt. The Netsh utility exists on Win2K, but the Windows 2003 and XP versions have a nifty Diag option that lets you do quick-and-dirty troubleshooting, like pinging every server configured to be a DNS, WINS, Proxy or Gateway along with any server configured in Outlook Express as a mail and news server. If you've spent most of your career using GUI tools, it takes a while to get accustomed to CLI utilities. Once you master them, though, you'll spend a lot less time doing grunt work. That will give you the free time you need to use your GUI tools for something valuable, like playing the latest version of Halo.